Zhang Weiying (張維迎, 1959-), a prominent professor of economics at Peking University, was born in Wubu County 吳堡鎮, Yulin 榆林 in North Shaanxi 陕北. Famed as part of the original ‘Old Liberated Area’ under Communist Party rule long before the establishment of the People’s Republic, North Shaanxi, or Shaanbei, is also home to some of the Party’s abiding origin myths — in particular, those to do with purity of thought, purpose and lifestyle. As we noted in our series ‘Drop Your Pants! The Party Wants to Patriotise You All Over Again‘, these were indeed just that, myths. However, the rural culture, traditional music and styles of popular performance of Shaanbei continue to occupy a hallowed place in a venerated cultural lineage. The 1984 film Yellow Earth 黃土地 directed by Chen Kaige introduced a new generation to the folk songs of North Shaanxi and, along with Zhang Yimou’s 1988 film Red Sorghum 紅高粱, a ‘Northwest Wind’ 西北風, or fashion evoking an ancient and larger-than-life Yellow River Culture, swept the nation. For a time it promised something more robust and ‘authentic’ than the cloying world of the official mainstream arts. In late March 2019, Professor Zhang Weiying gave this popular folk tradition — one that is by reason of birth and education, his own — a new twist. He wrote and sang a protest song in honour of his friend Xu Zhangrun. Below we provide the lyrics of that song, which was composed in the style of a genre known as ‘The Way of Heaven’ 信天游 in Chinese. 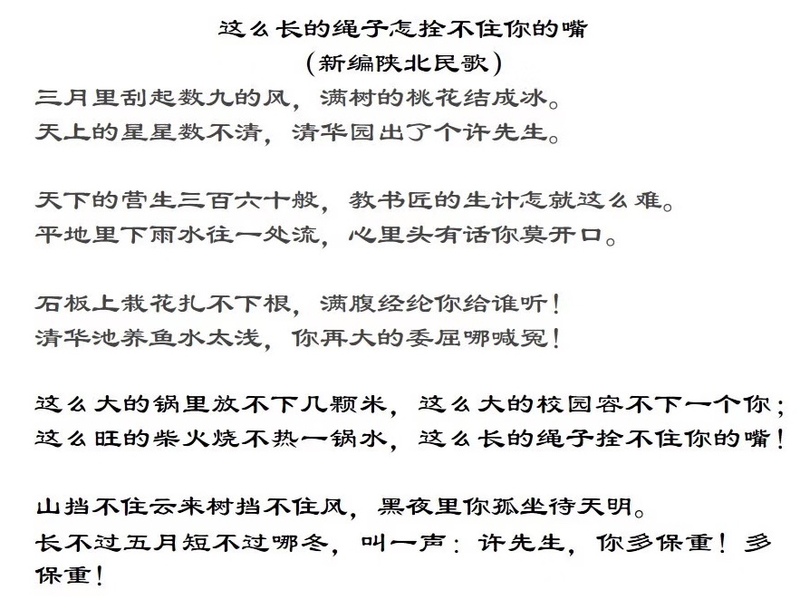 This is followed by a recording of Zhang and others singing the composition and a simple translation. Just as Xu Zhangrun’s writings speak from the cultural heart of a China that continues to pulsate despite seventy years of Communist Party rule, so too does Zhang Weiying’s moving serenade attempt to link the sounds of the past to a more hopeful future. For those who experienced moments of cultural exhilaration and intellectual promise during the 1980s, Zhang’s song evokes both a feeling of nostalgia and a lost vision for an ‘Other China’. There’s Just No Shutting You Up! Bitter winds gusting in March, peach blossoms frozen on the branch. Countless stars dot the Heavens, yet there’s only one Mr Xu in Tsinghua Garden. So many ways to make a living, why is the lowly teacher so cursed? The rain water gathers in one pool, no matter what: don’t you open your mouth. No matter your learning, who is even there to listen? A most dread injustice, but who will hear the lament? A campus so vast, but still no room is there for you. They have more than enough rope, but still it’ll never shut you up! In the deep darkness of night alone you sit, waiting for the dawn. Take care, Mr Xu! Be careful and take care!